Degredo are a duo from Portugal that plays a very ritualistic mixture of occult black metal and drone and this is a review of his 2018 album "A Noite dos Tempos" which will be released in November by Harvest Of Death. Dark soundscapes start off the album before going into more of a heavier and lo-fi direction along with a great amount of drones while all of the tracks are very long and epic in length as well as the vocals being done in a grim black metal style and at times the music gets very ritualistic. Elements of ambient, noise, avant garde and experimental can also be heard in the music while the songs stay away from the use of any traditional metal instruments along with some percussion also being utilized at times and as the album progresses a brief use of distorted reverb can also be heard briefly as well as one track also introducing acoustic guitars onto the recording, clean vocals can also be heard at times and all of the songs stick to a very slow direction. 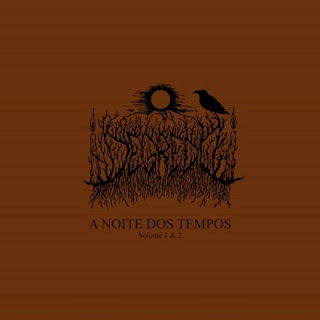 Degredo plays a musical style that takes occult black metal and mixes it with ritualistic drone to create a sound of their own, the production sounds very dark, raw and lo-fi while the lyrics rural and ancestral essays, tales from the Serra De Estrela Mountain and its surrounding areas. In my opinion Degredo is a very great sounding ritualistic mixture of occult black metal and drone and if you are a fan of those musical genres, you should check out this duo. RECOMMENDED TRACKS INCLUDE "Parte Um" and "Parte Quatro". 8 out of 10. Degredo are not a solo project. They consist of 2 members: Velha and Lagrisome. You can see their names inside the tapes and vynil record. There is 2 people in the project. Degredo IS NOT a solo project. It is a duo, 2 people. You should change the text.